Edward Thomas and Elizabeth Shaw used a surname as a middle name for some of their children. 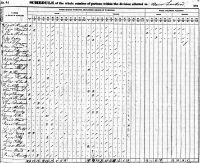 John Shaw Thomas and Elizabeth Goff followed the practice to a greater degree, but failed to use "Goff" as a middle name for any child. Perhaps "Goff" was the surname from an earlier marriage. Born Abt. 1796 Kentucky, U.S.A.
Married 13 Oct 1816 Nicholas County, Kentucky, U.S.A.
LDS FamilySearch Kentucky Marriages, 1785-1979: "John Thomas & Elizabeth Goff, m. 13 Oct 1816 Nicholas County." Divorced Bef. 1837 Kentucky, U.S.A.
1. Patsy Porter Thomas, b. 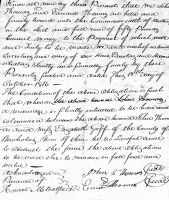 17 Feb 1817, Nicholas County, Kentucky, U.S.A.
5. James Owen Thomas, b. 22 Mar 1823, Nicholas County, Kentucky, U.S.A.
8. Frances Mary Thomas, b. 31 Aug 1827, Kentucky, U.S.A.
+ 10. Sarelda Thomas, b. Abt. 1831, Nicholas County, Kentucky, U.S.A.
Married 2 Jun 1837 Marion County, Indiana, U.S.A.
Indiana Marriages, 1748-1993: "Adam Rozier & Elizabeth Thomas, m. 2 Jun 1837 Marion County." Born - Abt. 1796 - Kentucky, U.S.A.
Married - 13 Oct 1816 - Nicholas County, Kentucky, U.S.A. Divorced - Bef. 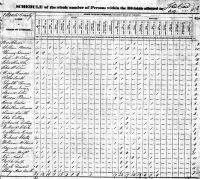 1837 - Kentucky, U.S.A.
Married - 2 Jun 1837 - Marion County, Indiana, U.S.A.